At 3:22 PM CEST (9:22 AM EST) on Friday, July 22, 2011, a car bomb exploded outside the Regjeringskvartalet in Oslo, Norway. The Regjeringskvartalet is a collection of Norwegian governmental buildings, including the office of the Norwegian Prime Minister. The explosion damaged large portions of the buildings, killing 8 and injuring 30. About an hour and a half later, a man dressed as a police officer opened fire on participants of a Labour Party youth camp on the island of Utøya, killing 69 and injuring 66. 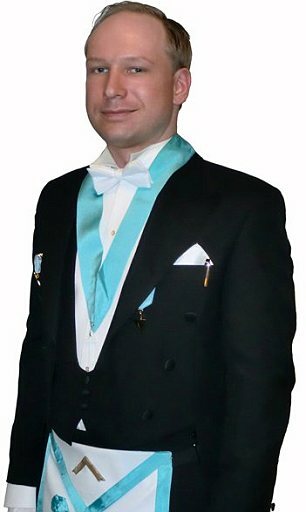 Norwegian police then arrested this man, who turned out to be 32-year-old Anders Behring Breivik, an ethnic Norwegian. Breivik has admitted to committing both attacks. As for the Church and science, it is essential that science takes an undisputed precedence over biblical teachings. Europe has always been the cradle of science, and it must always continue to be that way. Regarding my personal relationship with God, I guess I’m not an excessively religious man. I am first and foremost a man of logic. . . . It is not required that you have a personal relationship with God or Jesus in order to fight for our Christian cultural heritage and the European way. In many ways, our modern societies and European secularism is [sic] a result of European Christendom and the enlightenment. It is therefore essential to understand the difference between a ‘Christian fundamentalist theocracy’ (everything we do not want) and a secular European society based on our Christian cultural heritage (what we do want). So no, you don’t need to have a personal relationship with God or Jesus to fight for our Christian cultural heritage. It is enough that you are a Christian-agnostic or a Christian atheist (an atheist who wants to preserve at least the basics of the European Christian cultural legacy (Christian holidays, Christmas and Easter)). . . . He may have some residual cultural Christianity, but he is not a Christian – and certainly not a “Christian fundamentalist,” as some of the media is claiming. Further, he is a Freemason, which puts him even more at odds with true Christianity. "Boycott Israel" banner at Labour Party youth camp. Labour Party youth with Palestinian flags. Additionally, Breivik’s attacks fall on the 65th anniversary of the Zionist King David Hotel bombing, and Breivik was a regular poster on a neoconservative Zionist website. Cultural Christianity, civic nationalism, anti-racism, and Zionism mixed with anti-Islam is the ideology of neoconservativism, not the ideology of the far right. Breivik was basically a liberal Republican, not a right-wing nationalist. If Breivik and I had ever met, it is almost certain that we would have been completely unable to work together towards any political goals due to our opposing ideological foundations. His neocon beliefs notwithstanding, Breivik did have some things correct. Islam and cultural Marxism are extreme dangers to traditional European culture, Christianity, and the European peoples. He also correctly identifies the enemies of the West as not only the third-world immigrants, but also our own elites who have crammed multiculturalism, cultural Marxism, Islamization, and mass third-world immigration down our collective throats. Moreover, I will not denounce political violence as inherently wrong. There are times when violence is completely legitimate for the achievement of political ends. That being said, I do not believe that Breivik’s actions fall into this category. When violence is legitimate and when it is not will be covered in detail in the future in my ongoing Vindiciae series, so I won’t address it at length here. However, I want to make clear that I do not endorse what Breivik did. He is a murderer. Anders Behring Breivik isn’t a lunatic. This isn’t an obvious schizophrenic in the mold of Jared Loughner. This is someone who clearly understands the gravity of the situation and who was disturbed enough by what is being done to his country and his civilization to take matters into his own hands. . . .
As Whites are pushed into minority status in Europe and America by their own “leadership,” it is inevitable that people like Anders “The Incorruptible” Breivik here will start fighting back. This is what the French Revolution looked like when Louis XVI and Marie Antoinette lost their heads. The treasonous Western elites have pushed us, and pushed us, and pushed us. Did they really think that they could go on doing that indefinitely with no blowback? The elites and the media are already clamoring to take away more of our peoples’ gun rights, free speech, and freedom of assembly in the wake of these attacks; but that will only make things worse. Everyone has a breaking point, and the more they push us into an ethnocidal corner, the more people are going to snap. When liberal Republicans and neoconservatives like Breivik start snapping, then the elites definitely have something to worry about.